“Look who’s feeling festive today,” I say to the family, nodding toward the front window. Across the street, Mr. Neighbor is taking advantage of the almost sixty degrees in late November like the rest of the city. He strings up green Christmas lights first, then red. I smile at the swags of old-timey bulbs and memories of the man’s words from years ago. It’s a secret code, that outdoor illumination of his. And the warm message shines through our windows just fine. But life wasn’t always so good between Mr. Neighbor and us. The man first pounded on our screen door one day in the spring of 2004, fuming over the installation of our new central air unit (read The air conditioner for the full story.) I was eight months’ pregnant with baby #3, and my other two—only two and four years old—clung to me like my worries, so when he extorted an apology, I caved. I only wanted to disappear inside the house again with my babies and deadbolt the door. But Mr. Neighbor's issues went beyond our new modern amenity. In the days to follow, erratic behavior exploded all over his property, its shrapnel ripping even deeper into my sense of security. After a while, though, the jagged times smoothed. I set my attitude to cheery and baked cookies to share. I summoned my resolve and clasped onto hope. Persistence. Patience. Presence. But my efforts with our neighbor across the street were met with six years of silence. “And every year for six years now, he’s made good on his promise to you,” I say to the girls after retelling the old story. Across the street, Mr. Neighbor fastens a wreath to his front door. Ricka heads out of the house, steps onto the porch, and opens the screen door. She calls his name. He stops his work and turns toward her. 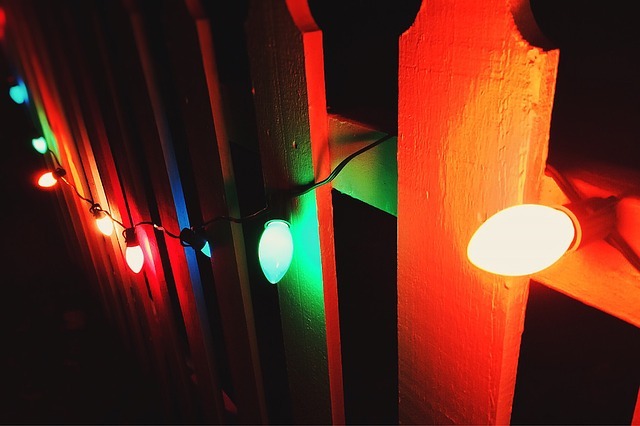 “Thank you for the Christmas lights,” she says.